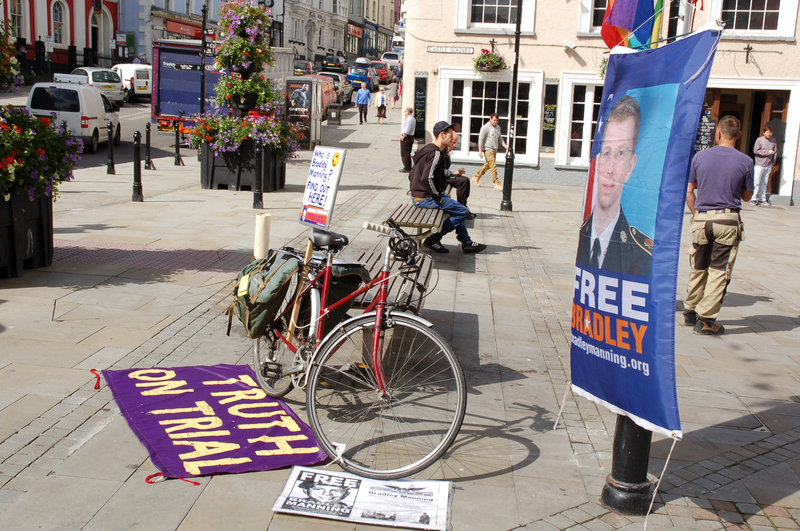 For the past three years I’ve been doing what I can to keep the cause of persecuted and imprisoned military whistleblower Private Chelsea (formerly Bradley) Manning in the public eye, or at least in the activist eye in Wales and England. Most of my efforts and those of the loose network of groups and individuals I work alongside have been documented on the wiseupaction.info website we set up for the purpose, reported on indymedia.org.uk, and occasionally in the mainstream press. During this time we’ve had some random encounters and support from unexpected places and one of the more bizarre of these was a consignment of hand-knitted hats and scarves sent to me in Wales for Manning supporters all the way from sunny California courtesy of Occupy Berkeley’s Knit In at the Sit In. I was touched by the spirit of solidarity that had inspired Occupy knitters thousands of miles away to make and send things to keep activists, babies and others warm in places such as Fukushima, Egypt and Newfoundland as well as cold, wet Wales. I enthusiastically accepted the offer, but instead of a box of hats and scarves, I received first a bill of around £35 in import taxes that had to be paid before the authorities would release the goods. It wasn’t a good start but I knew people had put time and love into their knitting so I grumbled a bit and coughed up the cash, a small act of faith that set off a chain of events leading to contact with Chelsea’s Welsh family and a trip to Ireland with them for one of the best solidarity efforts of the past three years plus plans for more. Never underestimate the possibilities in any situation. Never doubt that random acts of human kindness will lead good places. The hats and scarves were duly handed out to those who needed them. Mary and I wore them on a particularly damp and miserable day in July in Wrexham, a couple went to Helen and Wejdy in Newport and two more to Julia and Leonna from Faslane Peace Camp, all Manning supporters. 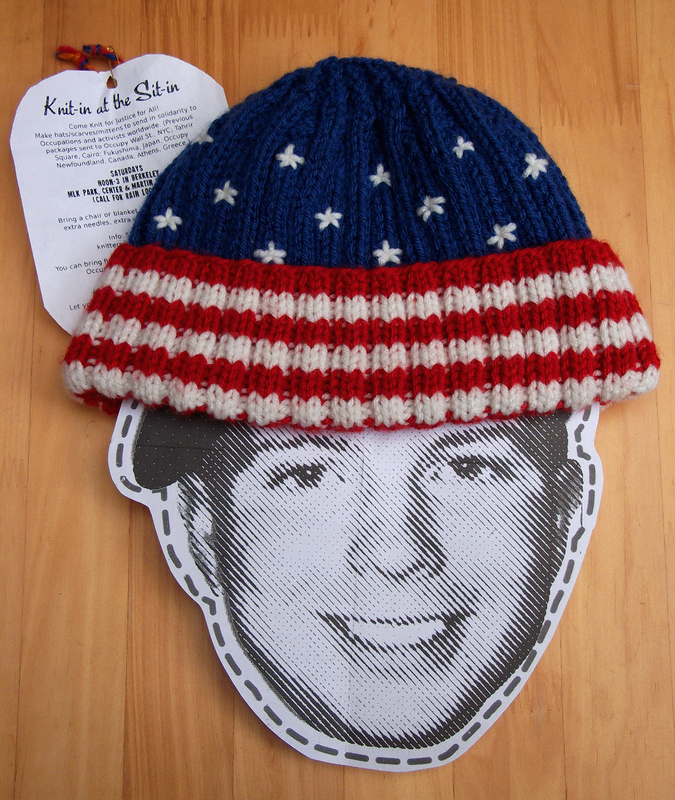 Each item came with a hand-made label, but one beautifully knitted ‘stars and stripes’ hat contained a letter – we were asked to pass it on to (then) Bradley or – failing that – a member of his Welsh family. Since items of clothing aren’t allowed into the prison, we hoped to get the hat to someone in the family but my initial attempts via peace activists in Pembrokeshire were unsuccessful and the hat stayed in the box over winter. 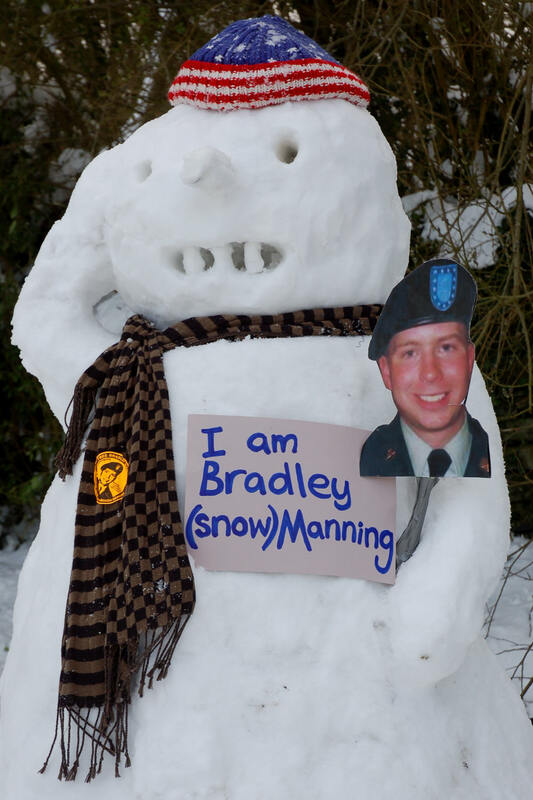 In March, we were snowed in for days and passed the time by making an 8 foot high snowman, loaning him the hat, a placard and a badge for an ‘I am Bradley (snow)Manning’ photo. A few days later I retrieved the hat, only a little worse for wear, dried it out and returned it to the box. 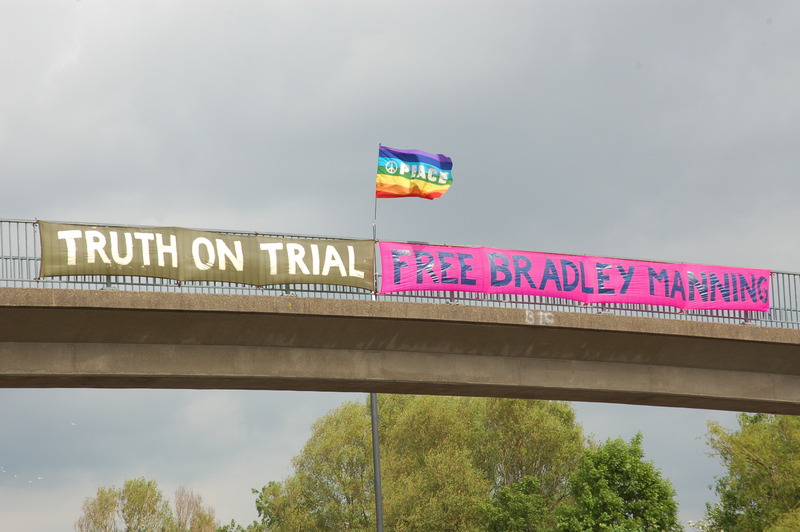 The hat came with me in May when I embarked on a Bristol and south Wales solidarity tour as the trial was finally about to get underway at Fort Meade, Maryland. 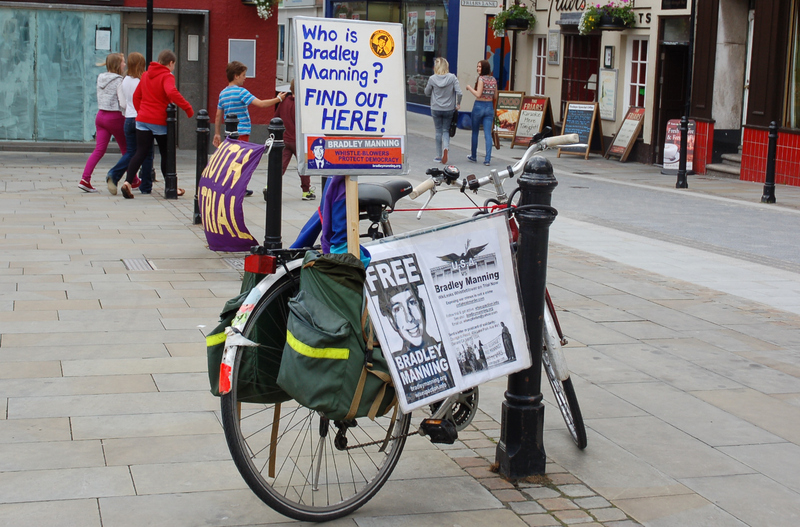 By the first day of the trial, 3 June 2013, I’d reached Haverfordwest and cycled over to Castle Square with my assortment of banners. The police in Bristol had seized my best ones but that’s another story (and the spurious court case against me was eventually dropped). I set up a display on and around my bike, grabbed a handful of flyers to give out and sat on a bench waiting for something to happen. I’d just come from Cardiff where a number of groups had organised solidarity actions over several days but no one else had been available to join me in Pembrokeshire. Nevertheless it felt important to have some kind of visible presence in the town where Manning has a large extended family to note the start, after three long years, of this trial of a young soldier who had acted on conscience and refused to remain silent in the face of murder, abuse, exploitation, corruption and cover-up. Would you mind giving this to your Mum to give to Pat to give to Bradley’s Mum Susan? She seemed pleased to oblige, so I handed it over. Many other people stopped by during the morning including a number of relatives; I began to feel more confident that my lonely and uncertain vigil was in fact a worthwhile act of solidarity that would be appreciated by the family of brave Private Manning. Back in Wrexham a few days later, my partner took a phone call from Susan, thanking me for the hat and saying she would call again soon. She did and we were connected, brought together by the solidarity of the Californian Occupy knitters. I met Susan’s brother Kevin in town during another visit to Haverfordwest while the trial was still underway; this was our second meeting as we’d also spoken in 2012 when we were in Haverfordwest for the Radicalisation of Bradley Manning play. 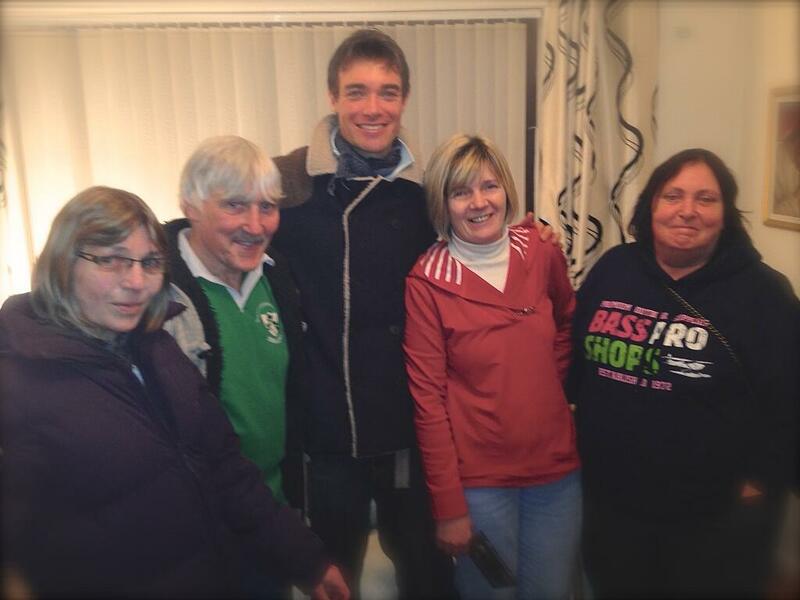 At the end of August I went back to Haverfordwest to meet members of the family after the sentencing, along with Ciaron O’Reilly who had raised funds for them in Australia last year and more recently in London. 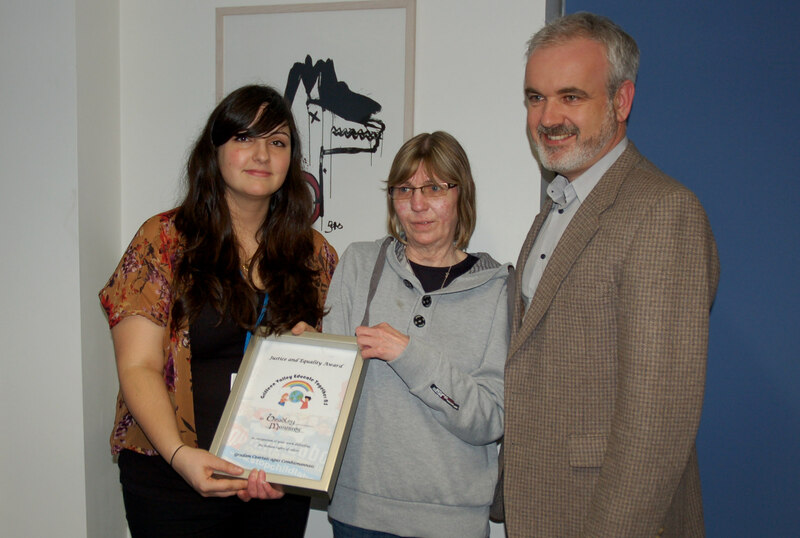 There was understandable caution on the part of the family who have had bad experiences in the past, but we got on OK and I was pleased we’d had the opportunity to meet in person and explain ourselves a bit. It was clear that the family felt unsupported and I wanted to find a way to change that, to offer support without imposing. The ongoing cost of prison visiting was clearly going to put stress on the family – they had self-funded their trips to date and would do so again, but raising money for this purpose seemed one practical thing we could do to take the pressure off, so a fund was set up to collect donations and we started a new website manningfamilyfund.org to document our solidarity efforts and encourage people to contribute, particularly those in Wales, Ireland, Scotland and England. 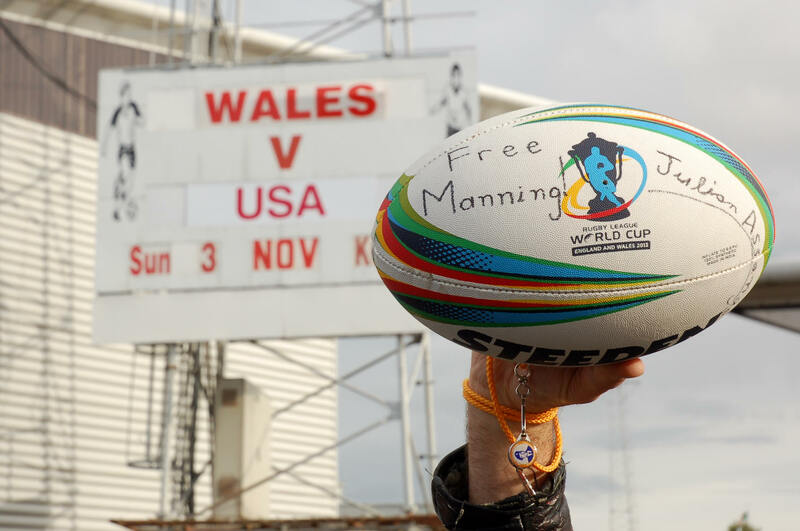 A rugby match was being advertised at Wrexham’s Racecourse football ground in November: Wales vs USA, part of the Rugby League World Cup series 2013. I mentioned it to Ciaron who – more sports orientated than me – grabbed the ball and ran with it. In the space of a few weeks, we called two vigils outside Wrexham rugby matches (Wales vs USA and USA vs Australia), made a couple of solidarity videos, put on a gig in Liverpool with musicians from Liverpool, Wales, London and Ireland, a great event unfortunately hindered by the bitter and twisted intervention of the intersectionalists whose idea of supporting Chelsea Manning was to disrupt our event; we also set up a draw for a rugby ball inscribed with ‘Free Manning’ and signed by Julian Assange that has helped us raise over £500 in donations in November. The next plan was to take members of the family over to Ireland. Chelsea’s maternal grandfather was born in Dublin and there are Irish connections on the Manning side of the family too, in Anascaul, county Kerry. I was apprehensive after the trouble in Liverpool, anxious about the risks involved in exposing the family to the possibly hostile attention of the media, worried about practical arrangements, financial viability, the fragile health of family members, whether sufficient support for the trip could be mustered in a short space of time. I’d only been to Ireland once before and that was nearly 30 years go, cycling round the sparsely populated south-east corner of the country in a heatwave that left me with sunstroke – an experience unlikely to offer many lessons for a Dublin city visit in November. It seemed like a very big responsibility with a lot of potential for things to go wrong. Fortunately for everyone concerned, Ciaron had faith enough to make up for my lack, knew the scene in Dublin, the culture of hospitality and solidarity, the good people on the ground there and was confident that if we brought the ball of solidarity to Dublin, others in turn would take it up and run with it. I was diverted from my anxieties in the days before the Ireland trip by the need to get new postcards designed, translated into Welsh and printed to promote the Manning Family Fund and also by a student production of The Radicalisation of Bradley Manning at Aberystwyth University where we’d been asked if we’d like to have a stall and to which we had invited Chelsea’s Mum, aunts Sharon and Mary and uncle Kevin, the four family members who would be travelling to Dublin the following week. Greg and Cassie headed to the university from Wrexham to mind the stall for the opening night and I decamped to Aberystwyth for the following three days having secured accommodation with friends of my friend Joan. The audience on Wednesday night included many Mums and other relatives of the 17-strong student cast, along with the Mum and relatives of our protagonist Bradley, or Chelsea, Manning – just a few years their senior and having shared the Welsh high school education many of them had recently completed. 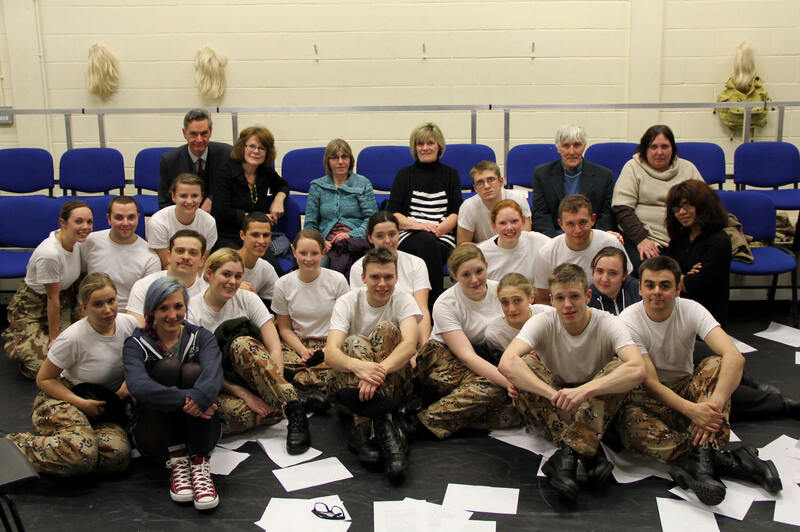 These students had lived, breathed and been Bradley for the previous two months (every member of the cast gets to play Bradley in the production) and their after-show encounter with family members was a powerful and emotional experience that left the family visibly moved and many of the students in tears. The play has been a big challenge yet such a rewarding experience for me. Exploring the different changes in Chelsea’s life has really opened my eyes to the horror and reality of the US government’s unfair treatment of Chelsea following an honest act of courage. I have laughed, I have cried and have reached a brand new understanding of the Manning case. As I say in the play, ‘If society casts you as powerless, why follow society’s rules?’ (Mrs Stokes Scene 16). On Wednesday 27 November, Susan Manning along with three of her siblings – Chelsea’s aunts Sharon and Mary and uncle Kevin – took the ferry to Ireland from Fishguard, while Ciaron and US Catholic Worker Carmen Trotta set off from Giuseppe Conlon House in London and I left from Wrexham, travelling via Holyhead to converge on Dublin for three intense days during which numerous people made the family feel welcome and supported; it was as if they had ‘come home’ which – in a way – was exactly what they had done. 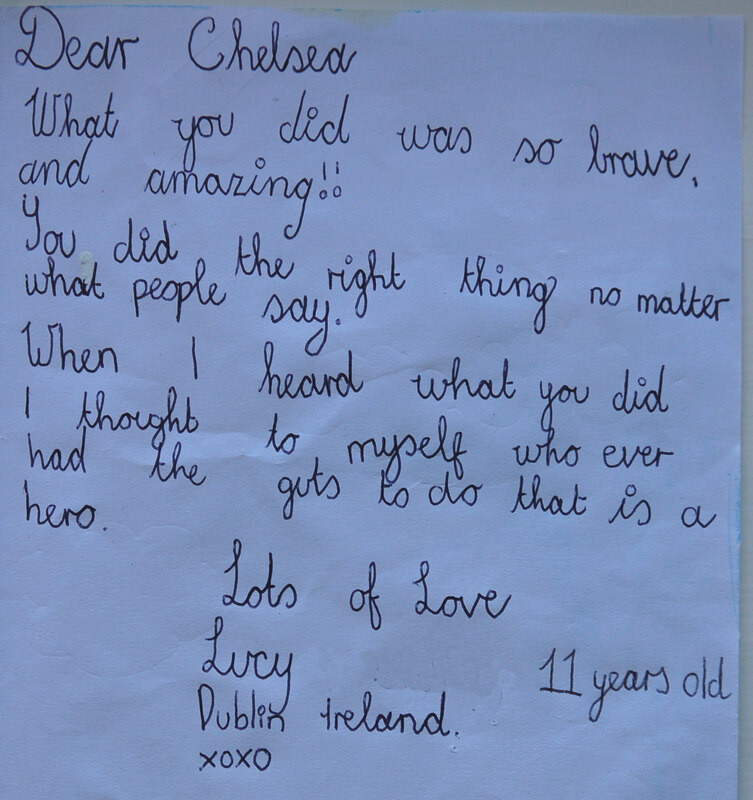 Their father Billy Fox, Chelsea’s granddad, was born and raised in Rathmines, Dublin and the family hope that they may now meet up with the extended family they have lost touch with over the years. On the Manning side, Chelsea’s great-grandparents, both Mannings, hailed from county Kerry with connections to the village of Anascaul. When asked in an interview whether Chelsea had ever been to Ireland, Susan and Sharon explained how Chelsea (like quarter of a million other US soldiers a year) was transported off to war via Shannon airport. This practice is a huge bone of contention between Irish anti-war activists and a government in thrall to the US that pays only lip service to neutrality. a maxim Chelsea seems to have taken to heart. Sharon spoke about how she had come to understand Chelsea’s actions only after viewing the Collateral Murder video footage on TV reports, and also recounted the difficulties the family had faced dealing with the US prison authorities over visits in the past three years; these ranged from a visit shortened from 2 hours to 40 minutes by excessive red tape to a flat refusal to allow Sharon in to see Chelsea at Quantico. They told stories from Chelsea’s childhood – winning school, county and state science awards; having a bank of computers at home and an office chair on castors to roll between them; only reluctantly leaving this den to come downstairs to eat Christmas dinner; struggling to cope with the move from the US to Wales and to find acceptance as a small, geeky kid with an American accent, big ideas and a stubborn streak. Our Dublin hosts Afri had requested a meeting with TDs and Senators at the Dáil. 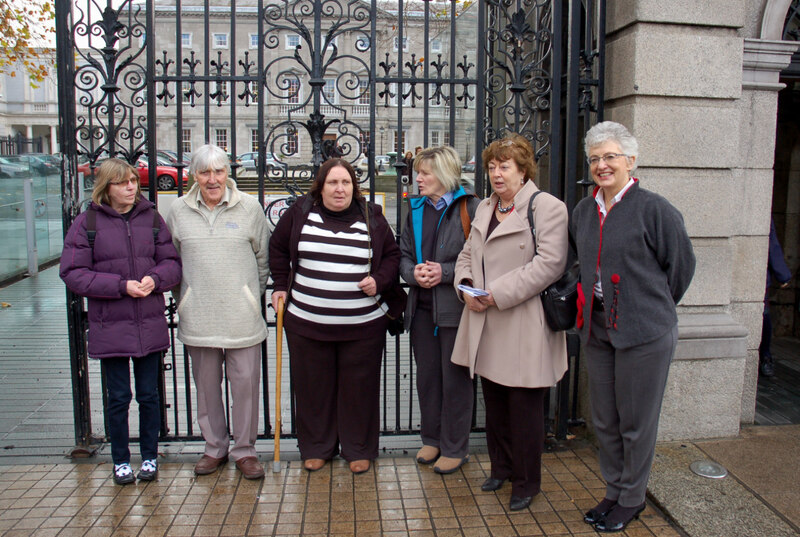 This was led by TD Catherine Murphy who greeted us at the gate along with Senator Katherine Zappone. On our way in we met Senator David Norris who apologised for not being able to attend the meeting and suggested (another) nomination of Chelsea for the Nobel Peace Prize. Joe Higgins, Clare Daly, Ming Flanagan and Sean Crowe were among the supportive TDs who listened to the family’s concerns in the meeting and suggested possible actions. 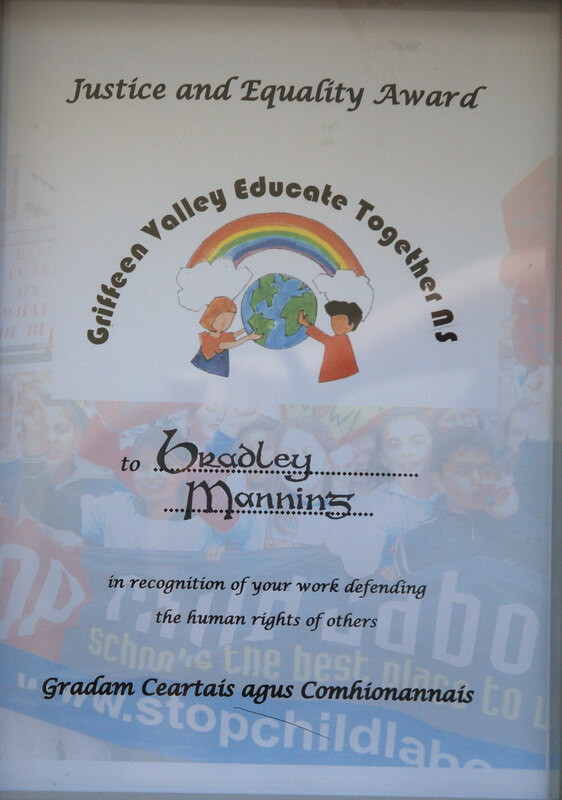 Other introductions organised by Afri included a meeting with Colm O’Gorman and others from Amnesty International (Ireland), during which Susan was presented with a justice and equality certificate from a local school where the children, all under 12, had studied the case a year or two back and had made the award from the whole school to ‘Bradley Manning, in recognition of your work defending the human rights of others’. The following day we met with staff from two more organisations: Frontline Defenders and Free Legal Advice Centres/Public Interest Law Alliance. Both promised to chase up contacts in the US and to do what they could to raise awareness in Ireland. We were joined at the end of this meeting by Gerry Conlon, arriving in advance of that night’s event at Trinity College and with lots of advice to the family about people who may be able to help them. The hospitality extended to the family in Dublin was open and generous; for example we enjoyed excellent meals in the homes of Joe & Mary-Lou, Ruairí & Susan, Mairtín & Andrea, at which last we were serenaded by RoJ, Mairtín and Carmen ‘Elvis’ Trotta and treated to some great tunes on the tin whistle from the children. There were solidarity events on three consecutive evenings. 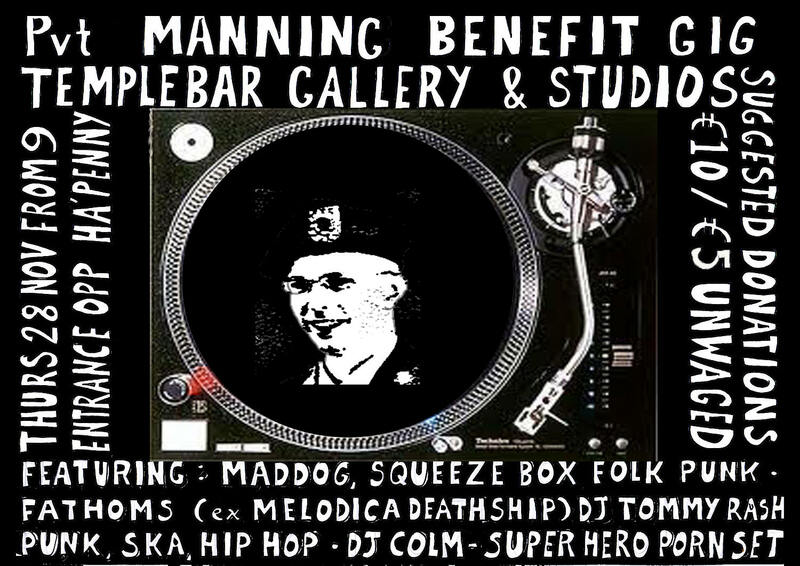 Seamus opened his studio and gallery in Temple Bar for a punk gig on Thursday evening that raised €80 for the Manning Family Fund. 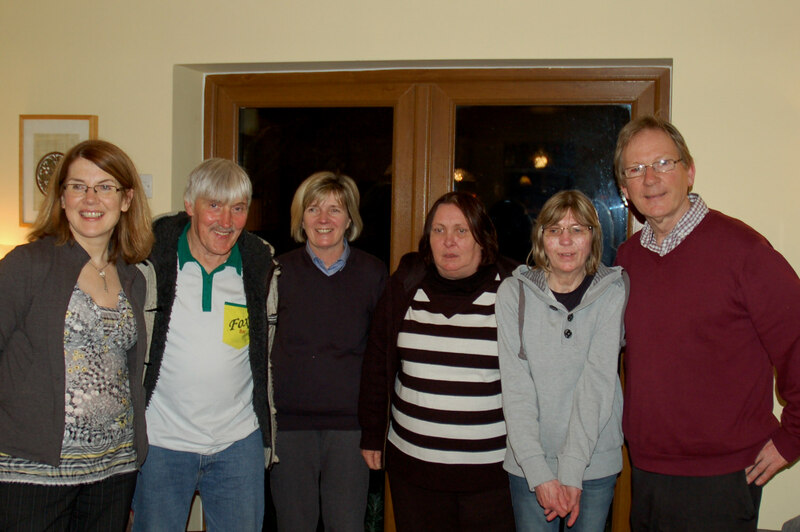 Afri hosted a meeting at Trinity College on Friday at which the generous audience donated around €850. 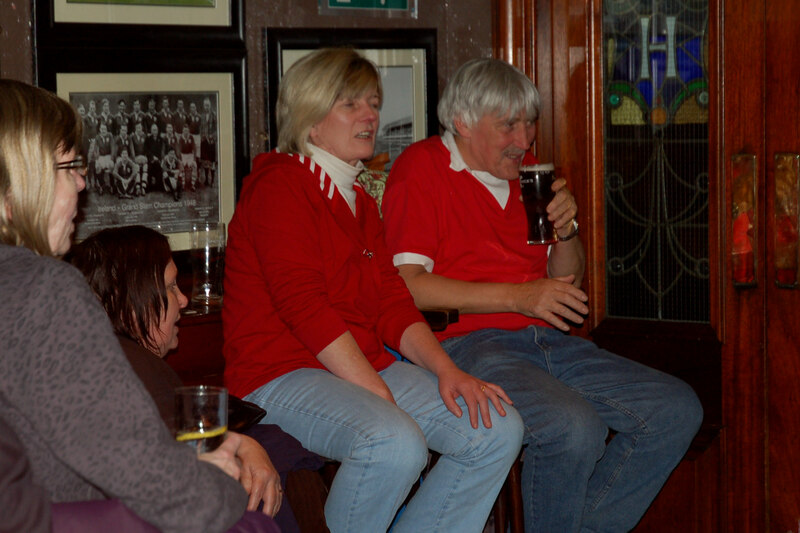 On the last night of the visit there was a farewell social at the Brian Boru pub in Phibsborough. On the Thursday, someone handed me a card for Chelsea to pass on to Susan , made by his 11 year old daughter and with a powerful message of solidarity inside. On Friday afternoon I briefly joined Carmen and Ciaron who were promoting that evening’s meeting outside Trinity College, with Ciaron later street speaking at Temple Bar Speakers’ Corner about Manning’s case, Irish connections, the wider context and the Trinity meeting. 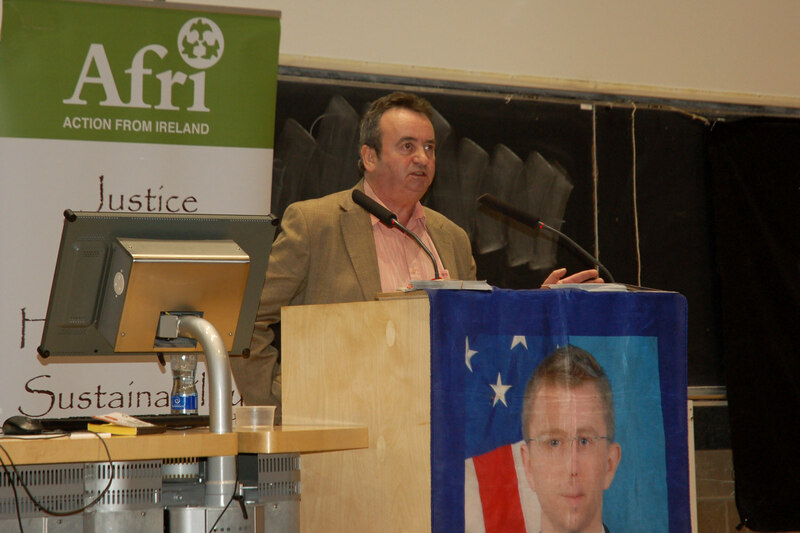 Gerry Conlon of the Guildford Four was the main speaker at the Trinity event, which happened to fall on the eve of the 39th anniversary of the beginning of his nightmare – when he was dragged from his bed in Belfast and rendered to London, tortured, framed and imprisoned for the next 15 years for a crime he had no part in. His father Giuseppe followed him to London to try to help, was himself arrested in another appalling miscarriage of justice as one of the Maguire Seven, and never saw freedom again, dying in a British jail in 1980. The meeting kicked off with songs from Joe Black, including one he composed about Giuseppe Conlon, inspired by the naming of the London Catholic Worker Harringay house of hospitality for Gerry’s father. Video footage of Joe performing this song at the house can be seen here. 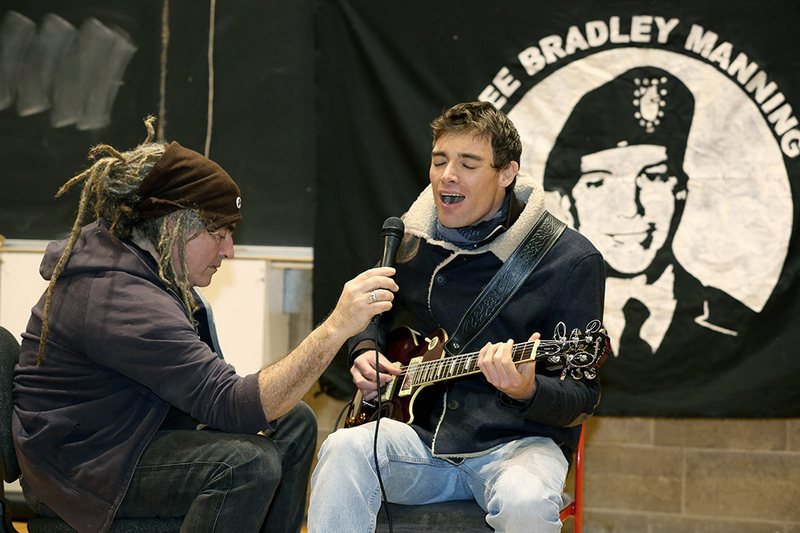 Other music was provided by RoJ Whelan who performed his song I am Bradley Manning with Ciaron as the human mic stand (photo by Tatyana Turchina). The 100+ people assembled watched a pre-recorded address from Gareth Peirce, the human rights lawyer who acted for the Guildford Four and Maguire Seven and who currently acts for Julian Assange, in which she praised Chelsea Manning’s brave and extraordinary actions, denounced the accepted norm that ‘right thinking people should agree with state criminality and do nothing about it’ and commented that Chelsea’s actions were based on the assumption that once right minded people knew about what was going on, they would be motivated to take action. Carmen Trotta of the New York Catholic Worker spoke next, outlining the significance of the courageous actions of Private Manning in the context of a grim 12 years of ‘war on terror’. Gerry Conlon then addressed those assembled, speaking passionately about his own experiences, noting how imprisonment isn’t just traumatic for the person in jail but affects the whole family, isn’t just for the period of detention but has lasting and devastating consequences for all concerned. He praised Chelsea Manning, noting the vital need for Mannings, Assanges and Snowdens, the truth-tellers and whistleblowers of this world, and said he wished they’d been around in 1970s Belfast to expose the framing and murder of innocent people at that time; some of these atrocities are only coming to light now, 30 or 40 years on. He called for support for Manning and whistleblowers everywhere. After Gerry’s speech and RoJ’s performance, Ciaron O’Reilly talked about the importance of solidarity outside for those inside and described his affinity with Manning as a former prisoner of the United States himself, having served 13 months in the 1990s for disabling a B52 bomber as part of a Plowshares action. Ciaron had been held in appalling conditions in a jail close to the Mexican border, arriving by way of Fort Leavenworth where Manning is and will continue to be held. He explained how the solidarity of the 1700 people who had sent letters had saved his sanity and provided physical protection for him on the inside, not least because abusive guards held back once it was clear there were many people out there with an interest in his well-being. There’s a saying… that we all have freedom of speech, but my nephew spoke out and it cost him his freedom. I just wish we could get some more help and support. Members of the audience were then invited to comment. Contributors included Ruairí McKiernan, a presidential appointee to Ireland’s Council of State, who said it was an honour to meet the Manning family. He said the story of Chelsea’s grandmother telling her repeatedly ‘if you can’t tell the truth, don’t bother talking’ was a powerful thing to reflect on given what Private Manning is being punished for. He talked about the strong Manning family connection to Ireland, that Private Manning had only visited Ireland by using the controversial U.S military stop over at Shannon Airport, and said the Manning family should be congratulated for staying so strong throughout their ordeal. 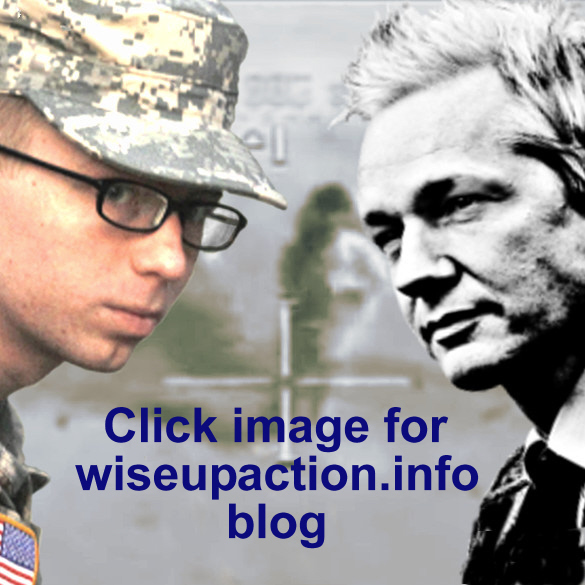 He concluded by saying that Private Manning’s Thanksgiving Day message from prison shows how the important voice of Private Manning isn’t going away despite her imprisonment. Many people stayed around after the event to meet family members in person and offer their solidarity, support and good wishes. 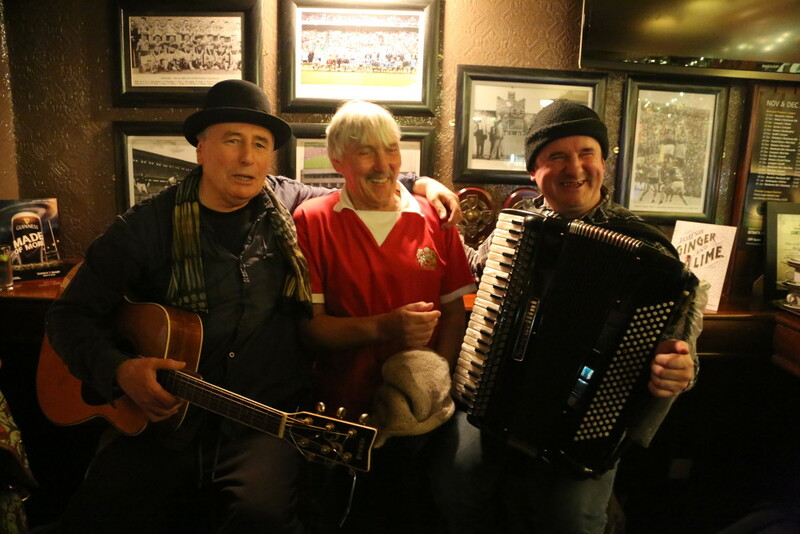 On Saturday night, a social gathering at the Brian Boru pub concluded the visit with live music including traditional tunes and many protest songs. 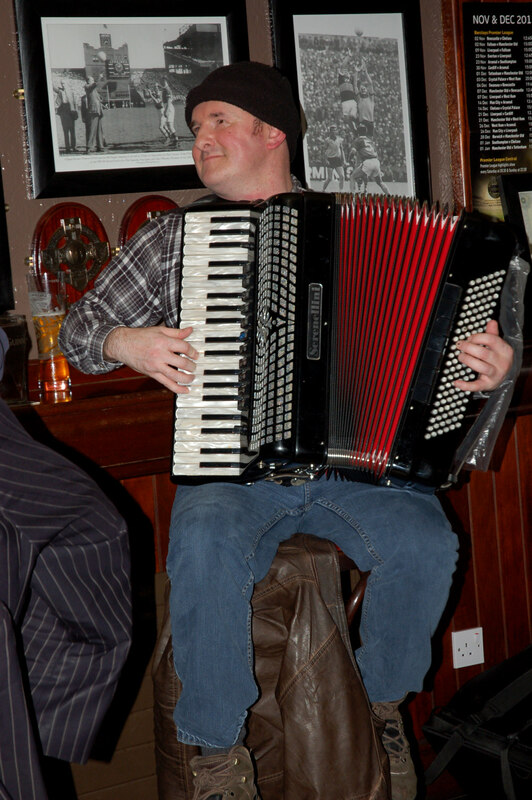 Musicians included Robbie Sinnott on accordion, Joe Black, Mairtín, ‘Elvis’ and others. The family, with a 5am start the next day for the Rosslare Sunday morning ferry, bowed out before the end to fond farewells and many invitations to return. Thanks to Dave Donnellan, a short video of the whole visit will be produced soon. Acts of solidarity are not hard to commit; the difficulties lie in initiating them in the first place and sustaining them afterwards into an ongoing effort. Both of these challenges are made easier when others get involved with their ideas, energy and enthusiasm, so it was heartening to be part of discussions right through this visit about how the good folk of Ireland might continue to offer their support in various ways. The Wales-based family, meanwhile, were talking about bringing the solidarity home and organising events in Pembrokeshire. The Truth Fest will include mainly theatre and music, interspersed with talks and discussion. The main idea is to show support from Ireland for Bradley/Chelsea Manning and the Manning family, as two grandparents came from Ireland. 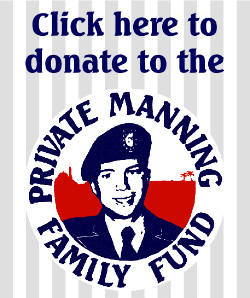 We want to celebrate truth in solidarity with the Manning family, and in particular the family member who is being punished for following a grandmother’s motto:- if you can’t tell the truth, don’t speak. He told the truth. 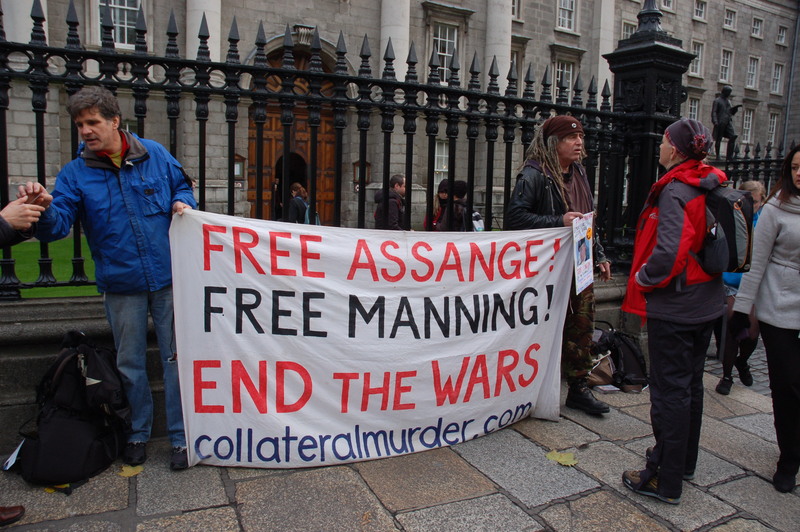 Gallery | This entry was posted in Events, Reports and tagged Afri, benefit gig, Bradley Manning, Carmen Trotta, Chelsea Manning, Ciaron O'Reilly, Donal O'Kelly, donations, Dublin, Family Fund, Gareth Peirce, Gerry Conlon, Ireland, solidarity, Wales. Bookmark the permalink. It was a great honour to meet Chelsea’s mother in person in Trinity CCollege on the Friday night. It was the only function I was able to attend due to a bad throat and oncoming flu. 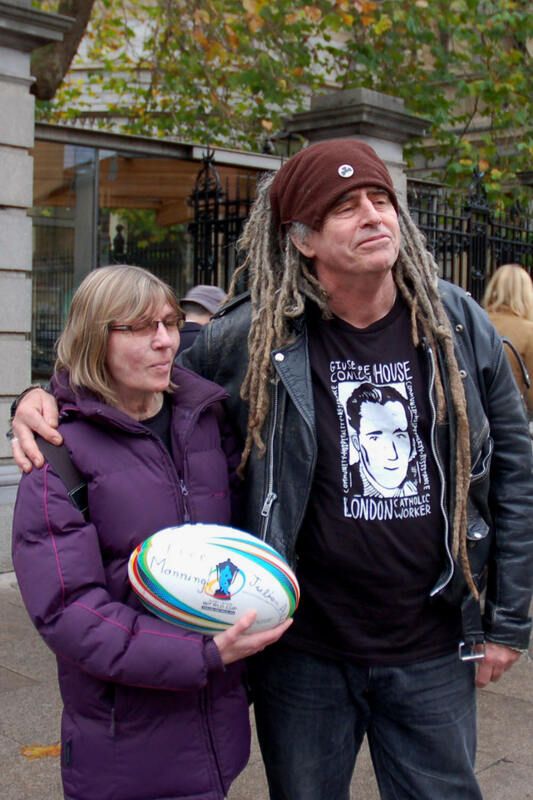 I ws kindly offered a mic to help my voice be heard from the stage – but what can one really say about this most remarkable woman, to her extraordinary mother Susan and her supportive family Sharon, Mary and Kevin (aunts and uncle), Except, welcome to Dublin, welcome to Ireland and please tell Chelsea that we will continue to support her 100%.